I’ve come to the realization in the past few years that I am one of those people who wants everything there is to be had out of life. I hate missing out, and I love knowing things. And I’d really like to have it all: the grounded life and the big adventures, the professional climb and quiet domesticity, the cohesive and serious whole and all of the delicious-yet-frivolous bits. I try to balance these where I can, wondering all the while if it would be better to just choose and go in one direction, full force. A couple of dear friends of mine recently visited the Bay Area, and we spent an amazing afternoon wandering through the Ferry Building, eating delicious Vietnamese food from Out the Door while gazing at the Bay, walking down the Embarcadero, drinking cocktails on the sunny, marble-encased back patio at Trou Normand, working our way through so many conversations. I remembered how lovely it is to have an unstructured, unplanned afternoon to laze away with friends in the sunshine. And I remembered, too, that I’m not alone in asking those questions, in trying desperately to live a thoughtful, generous, giving life in an increasingly fast-paced (and complicated as always) world. I’ve had different versions of the same conversation with all of my closest friends: let’s gather up all of our favorite people and make a way to live together, a little like a commune but not quite, avoiding the traps of modernity and pooling our resources so that the world doesn’t feel so stupidly unaffordable. Maybe in an apartment building in the city, with a downstairs classroom for our future children, or maybe on a big piece of farmland, with space for each one of us and opportunities to contribute our own unique skills for the good of the whole. It’s appealing. Because we’re not so sure about the rat race, and we’re not so sure about disengaging altogether, and we’re not so sure about going it alone. We don’t want to sell out or burn out, and we’d love to have some degree of professional success alongside happy families and healthy relationships. I know we can’t actually have it all. I’m also quite certain that the loving, generous, balanced-as-possible life seems to be the right one. It can look a million different ways. But if we burn out in pursuit of glory, with nothing left to give to the people we love, success won’t be worth a damn thing. And I also know—and have been reminded anew by both Sufjan Stevens and my aunt—that ultimately, what we’ve got to do is be grateful and stop worrying and forget about the dirty dishes and concentrate on seeing and go to bed early to quietly contemplate and embrace those we love over and over again and drink wine in the afternoon. Perhaps what we really ought to do is set aside the questions altogether. Because if I must choose, it is quite clear what I want: to be present and grateful, enjoying whatever it is that’s right in front of me, not lost in the weeds, not catastrophizing about the unknown future … just living. This is the sort of dessert that embraces the moment right at hand, blissfully and without pretense. When I first tasted it—the glorious combination of meringue, whipped cream and fresh berries—I laughed out loud. It is truly delightful, in the way only things with cream on them can be. But even better, because of the summery fruit and varied textures and wonderful frivolity of the whole thing. Plus, I rolled it up, which of course left me with cream on my fingers and filling sliding out the edges, a mess that could be called rustic but need not be, since we’re not worrying about such things, remember? I don’t have the answers, let alone a five-year plan. But I do have whipped cream on my fingers and dessert for the masses and fresh laughter in my heart. I do have this, this bliss that sings through the questions and chaos. And today, that’s more than enough. Preheat the oven to 425 degrees. Line a 13 by 9 1/2-inch (approx.) 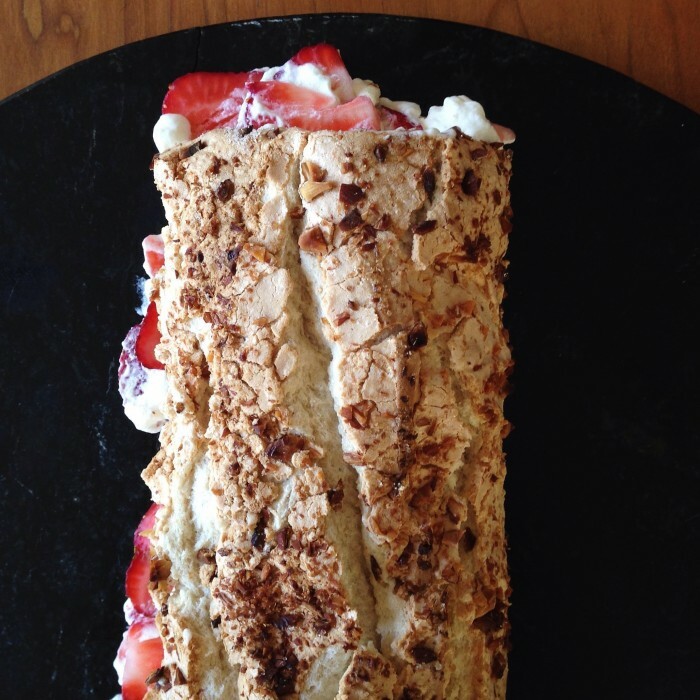 rectangular or jelly-roll pan with parchment paper, bringing the paper up the sides of the pan. Brush lightly with oil. Put the egg whites into the bowl of a stand mixer and whisk at high speed until light, fluffy and stiff. Gradually add the sugar, continuing to whisk the whole time. Fold in the tapioca starch and vinegar. Pour the mixture into the lined pan, smoothing it evenly, then scatter with the almonds. Bake for 10 minutes, then turn the heat down to 325 degrees and cook for about 15 minutes more, until the meringue is golden on top. (Mine rose quite significantly, then fell—don’t worry if this happens to you, as it turned out perfectly!) Remove from the oven. Place a sheet of parchment on a work surface, dust it with sugar and tip the meringue upside down onto the paper. The meringue should fall out with the lining paper. 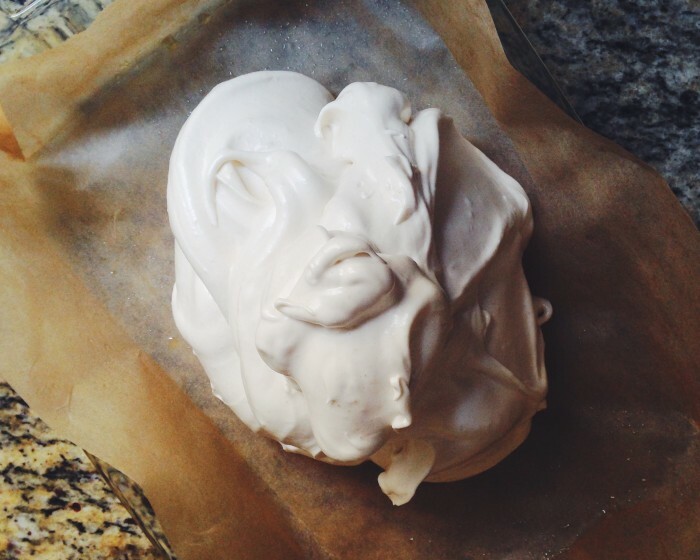 Gently peel the paper from the meringue, cover it lightly with plastic wrap or parchment and leave to cool. Pour the cream into a bowl (cool if possible) and whip lightly, so that it almost stands in peaks. Peal the plastic off the meringue. Spread the cream over the meringue, smoothing it nearly to the edges with an offset spatula. Scatter the berries over the cream. 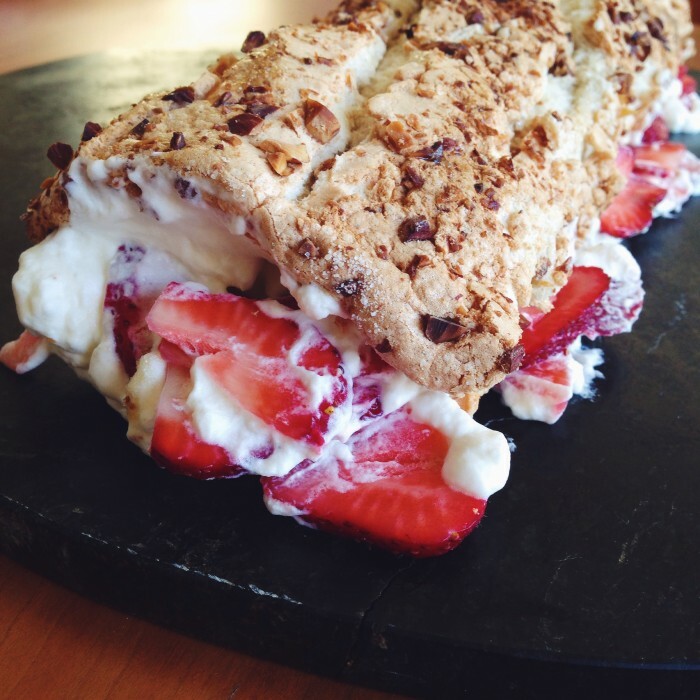 Take the long edge nearest you and roll the meringue up gently but tightly, like a roulade. 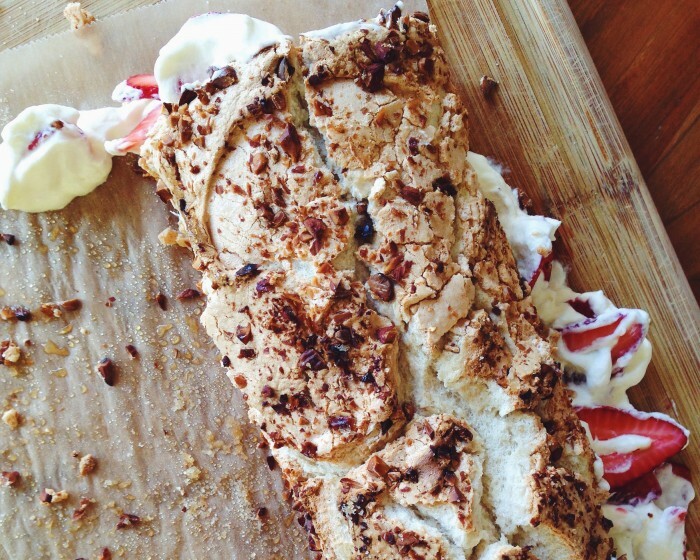 Don’t worry if some of the cream and berries slide out the edges; it’s prettier that way, after all. Transfer to a long serving platter and allow to settle for at least a half hour before serving.